Well hello, Beautiful 😍! Just look at these beauties. And might we say, “Happy Birthday!” These delicious treats are 1 year old today. Can you believe it? One year ago, these fluffy, scrumptious, enticing muffins came into our lives. Many thanks to their muffin mamma, Monique from Ambitious Kitchen for her pure genius in whipping up this recipe. To view full original post, click here. See below for an excerpt on how these muffins came to be. 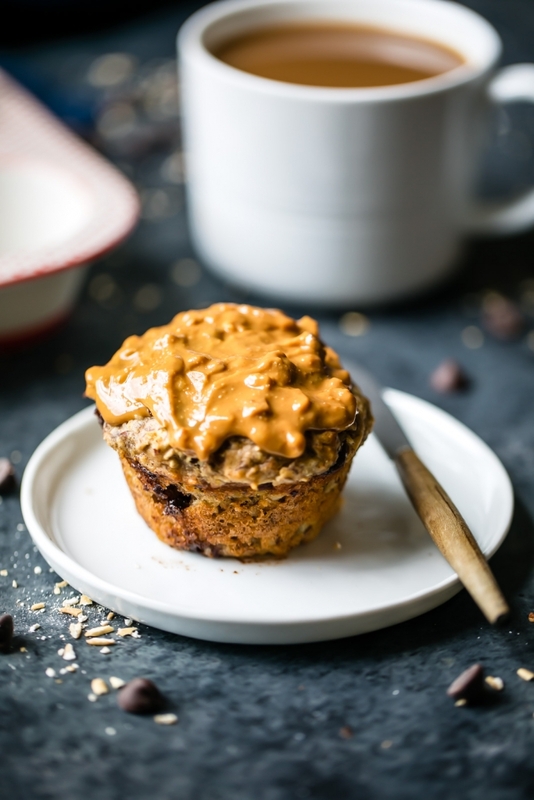 “When I first thought of creating a healthy power muffin,” Monique says “I wanted to have ingredients that would energize you before a workout, or give you a boost during that 3 p.m. slump. 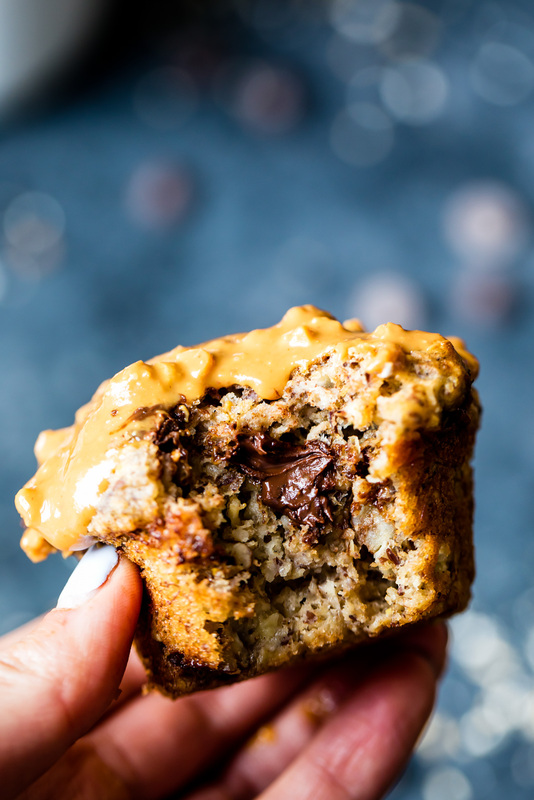 “So I created a unique blend of ingredients to create a fluffy muffin packed with whole grains, protein and satisfying flavors of banana chocolate chip. “Bananas: Make sure you use EXTRA ripe bananas in this recipe (you know, the bananas with brown spots all over them). 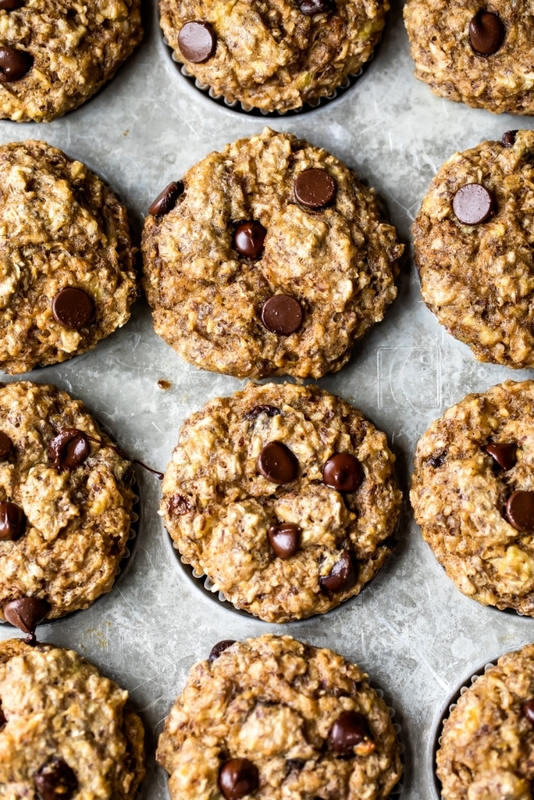 Using ripe bananas helps to sweeten the muffins, since there is no added sugar in this recipe. “Vanilla Greek Yogurt: I used vanilla because it helps add flavor to the muffins. I recommend sticking with this. I love using Greek yogurt for an extra boost of protein! 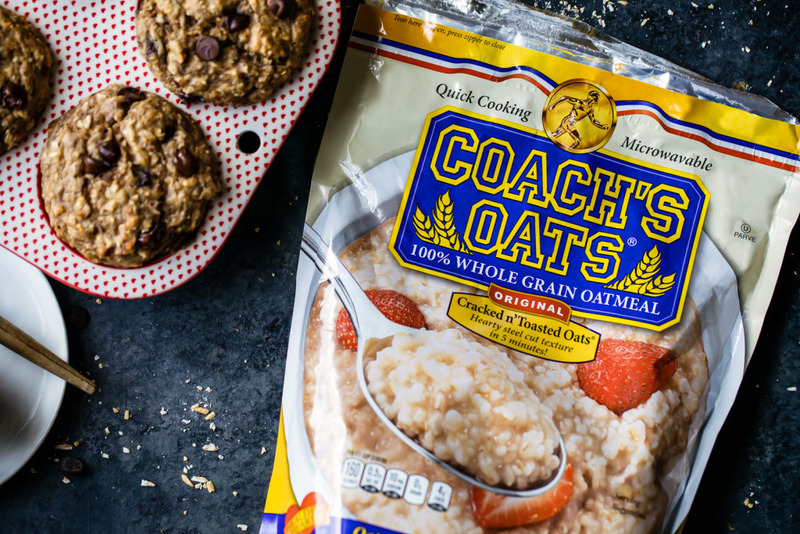 “Coach’s Oats®: We chatted about these above, but they’re ridiculously delicious and I love the texture these give the muffins. Coach’s Oats help to add over 12 grams of protein and 8 grams of fiber to this entire recipe. “Flaxseed Meal: These are just ground flaxseeds and contain a good amount of fiber, protein and omega 3. They are available at most grocery stores. “Whole Wheat Pastry Flour: This is one of my favorite flours to bake with! It’s not regular whole wheat flour or white whole wheat flour. Whole wheat pastry flour is milled from soft white wheat. “Chocolate Chips: A few dark chocolate chips never hurt anyone. They really help to sweeten the muffins and keep them kid approved. If you want to use a less sweet chocolate, chip up a 3.5oz dark chocolate bar and use that (they often have less sugar than chocolate chips). Preheat oven to 400° F. Line a 12-cup muffin pan with liners and spray the inside of the liners with nonstick cooking spray. This is important so the muffins do not stick to the liners. I recommend using liners, because larger muffins can be difficult to get out of the tin without liners. In a large bowl or blender, mix together the Greek yogurt, almond milk, mashed banana, oil, egg and vanilla until smooth and well combined. Transfer to a large bowl, and stir in Coach’s Oats. Allow the mixture to sit for 5 minutes to soften the oats. After 5 minutes, add in the whole wheat pastry flour, flaxseed meal, cinnamon, baking soda and salt. Stir until just combined. Fold in chocolate chips and chopped nuts. Divide batter evenly between the liners. Bake for 7 minutes at 400°, then reduce heat to 350° (do not open the door!). Bake for 13-16 minutes more until tester comes out clean or with just a few crumbs attached. Allow to cool for 5 minutes in pan before removing and transferring to a wire rack to finish cooling.